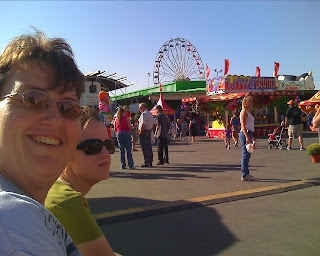 Today Patti, Danneel, and I went to the Arizona State Fair in Phoenix. I have to say I was amazed with all of the rides they had. 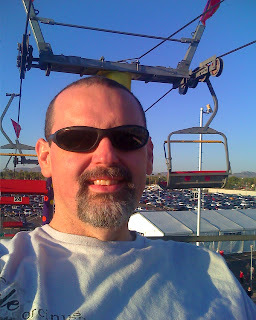 Seriously, There were more rides than I think I have ever seen in one place in my life! And I have been to major theme parks! Well anyway, we had a good time. The only thing it was lacking was large roller coasters, it had small ones though, and it is not a theme park. We went and looked at the animals, art, and other entries, but I am all about the midway. We then went to the cheesecake factory for dinner and then caught the late show (Wall-E) at the $2.00 theater. Wall-E came out this summer, but since it is not a current movie they can show it in the $2.00 Theater. That's fine since we missed almost all of the first run movies being in Lordsburg. Not that I don't love living in Lordsburg, but we do miss a lot of movies. Patti and Danneel taking a breather. Treb thanks for taking me. 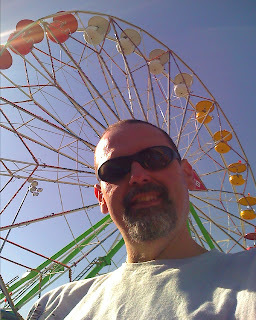 I loved the state fair even with it being windy and cool.